GW Pharmaceuticals Plc (Nasdaq: GWPH) stock surged some 10% to $74.90 during trading today (Friday) on news the U.S. Food and Drug Administration granted Fast Track designation status to the British company's product Epidiolex. The in-development treatment is an investigational cannabidiol product used to treat Dravet syndrome, a rare and catastrophic form of childhood epilepsy. The FDA's Fast Track designation means a drug under review (Epidiolex) targets serious medical conditions and fulfills an unmet and urgent medical need. Typically, trial drugs that have received Fast Track designation are generally granted greater access to the FDA for the purpose of accelerating the drug's development and FDA review. The designation also implies a much quicker drug approval process when the drug is given the nod from the FDA. "GW is focused on advancing the Epidiolex development program as rapidly as possible with the aim of addressing the significant unmet need in children suffering from Dravet syndrome," Justin Gover, GW's chief executive officer, said in a statement. "The granting of Fast Track designation, in addition to Epidiolex having already received orphan drug designation from the FDA, represents significant additional support toward this objective. With GW having already opened an Investigational New Drug (IND) for Epidiolex, we are on track to commence a phase 2/3 clinical trial in Dravet syndrome in the second half of this year." Excitement over Epidiolex was what sent GWPH stock soaring Friday. But this is no short-term bump. The world's first plant-derived cannabinoid prescription drug, Sativex, is already approved for the treatment of spasticity associated with multiple sclerosis in 25 countries. Additionally, Sativex is in phase 3 clinical developments as a potential treatment for pain in people with advanced cancer. Japanese drug giant Otsuka Pharmaceuticals is funding Sativex's phase 3 clinical trials. It has also agreed to pay all development costs related to the U.S. market. GW has also teamed up with three other heavy hitters to advance Sativex's presence and reach. Almirall S.A. is collaborating with GW to develop the drug in Mexico and parts of Europe. An arm of Novartis AG (NYSE ADR: NVS) is aiming at parts of the Middle East. 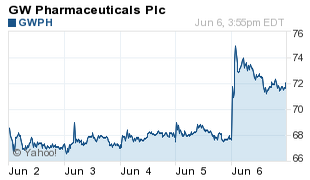 And, Bayer AG (OTCMKTS ADR: BAYRY) has been instrumental in assisting with Sativex's development in the UK and Canada.